THE ROMEROS at Mayo Performing Arts Center (MPAC) in Morristown on 2019-04-19 -- Nobody covers the arts throughout the Garden State like New Jersey Stage! 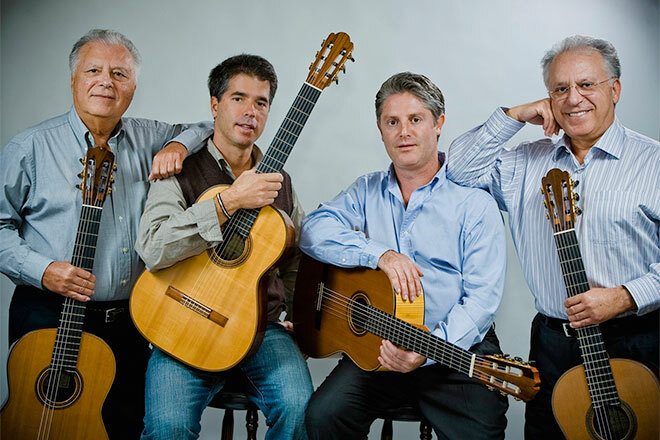 Over half a century after walking onto the world stage as the first classical guitar quartet, The Romeros continue to be a veritable institution in the world of classical music, dazzling countless audiences and winning the raves of reviewers worldwide. In 1957, the family left Spain and immigrated to the United States, where three years later, “The Romeros” became the first guitar quartet while the boys were still in their teens. The Romero tradition of family and love for the guitar provided the fertile ground for the next generation of guitar virtuosos as Celino and Lito joined the quartet. A recent project with Deutsche Grammophon included a much-anticipated Christmas music recording featuring favorites from around the world. “Christmas with Los Romeros” was released worldwide and accompanied by tours in Europe, the United States and Asia, featuring music from this recording. Other recent recordings include a recital CD by Sony Red Seal label, entitled appropriately: Los Romeros: Celebration and DECCA released a retrospective collection, Los Romeros: Golden Jubilee Celebration. The sterling reputation of The Romeros has been confirmed by repeated recital performances and orchestral appearances with symphony orchestras of Boston, Chicago, Detroit, Pittsburgh, Philadelphia, Cleveland, Los Angeles, San Francisco, Berlin, Vienna, Madrid, Sevilla, Amsterdam, Munich, Rome, Shanghai, Seoul, among many others. They have made frequent festival appearances throughout the world, including the Hollywood Bowl, Saratoga, Blossom, Wolf Trap, Salzburg, and Schleswig- Holstein. the 92nd Street Y and Rockefeller University. They have appeared at Vienna’s Gesangsverein and Konzerthaus, the Berlin Philharmonie, Amsterdam Concertgebouw, Zurich Tonhalle, Madrid Auditorio Nacional de Musica, and the Beijing Concert Hall. The Romeros have performed on multiple occasions at the White House and many other venerable institutions worldwide. In 1983, they appeared at the Vatican in a special concert for John Paul II, and in 1986, they gave a command performance for his Royal Highness, the Prince of Wales. In 2000, His Royal Majesty King Juan Carlos I of Spain knighted Celin, Pepe and Angel into the Order of “Isabel la Católica”. Tonight Show and The Today Show, PBS’s Evening at the Boston Pops, the KPBS/PBS biographical documentary Los Romeros: The Royal Family of the Guitar, other PBS specials and the NDR documentary film Los Romeros: Die Gitarren-Dynastie.